So since the conversation about Hex signs led to a conversation about beer which led to a brief history of Allentown and since Allentown and Bethlehem are practically the same thing (and Easton, but that's irrelevant to this story, so we'll ignore it for now) I figured this might be as good a time as any to share a story I heard in Bethlehem about the Sun Inn and the haunting of same. 1777 ~ Meeting of the leading members of the Continental Congress. Signed the order of Protection. 1792 ~ A deputation of Six Nation Indians, fifty-one chiefs and warriors, including Red Jacket, the Corn Planter and Osiquette, lodged at the Inn on the way to Philadelphia to meet General Washington. 1803 ~ Commodore Berry of the ship United States stayed at the Inn. 1865 ~ November 3, a gala dinner for the honorable Asa Packer upon his announcement of the founding of Lehigh University. 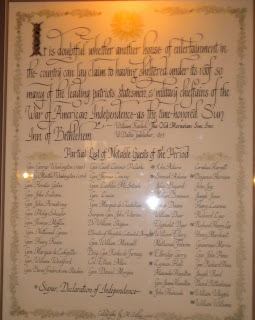 1892 ~ Memorial Tablet placed on the occasion of the Sesqui-Centennial Celebration of the settlement of Bethlehem. 1910 ~ Brother Albrecht's Secret Chamber: A Legend of the Ancient Moravian Sun Inn at Bethlehem Pennsylvania and What Came of It was published. 1972 ~ Founding of the Sun Inn Preservation Association to restore the Inn. 1982 ~ The restored Sun Inn is opened. 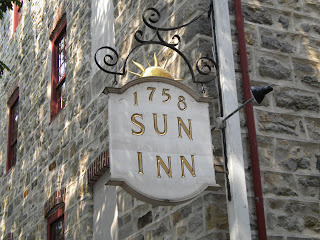 During our visit, we learned that many notable people had visited and accepted the hospitality of the Sun Inn. We visited some of the guest rooms and suites that had housed them. Yep. George Washington slept here. 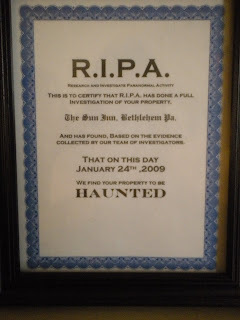 RIPA Members say they have had their pants leg tugged, their hat tapped and their hair pulled. A camera left recording in an empty room was mysteriously knocked askew. It is the tangible evidence of strange happenings that is the most exciting for the group. And there is plenty of strange evidence. Members speculate that the music-loving spirit is William Jones, who was secretary of the Navy under President James Madison and died at the Inn in 1831. Now old Bill isn't the only apparition who has made his presence known at the Inn over the past couple few years. There's a little girl who has been mentioned. And there have been strange figures in the windows. I don't know if I believe all of this or not, but I DO know that I won't be making any reservations at the Sun Inn anytime soon. Now we've come full circle, like a Hex itself, in physical as well as spiritual form. Perfect for Halloween, haunted Inns, Hex symbols and beer. 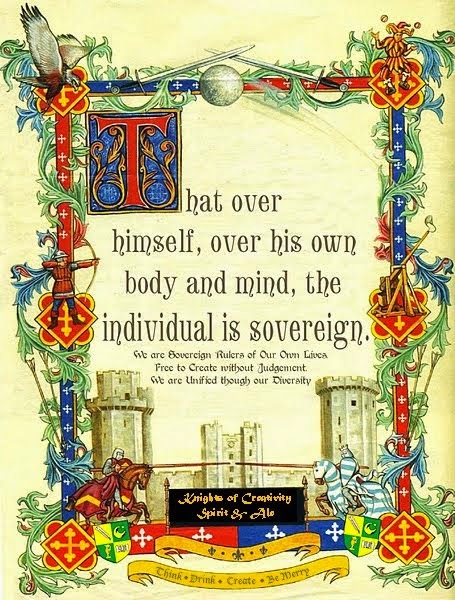 Thanks Lady T for contributing your talents once again on the KMSA blog! Coooo Lady T...I'm not knocking that one at all. that is ancient in US terms, indeed my eyes lit up when i read it, that a) I didn't know about it or hadn't visited it and B) that such an old building was still serving beers and carrying on as if time stood still. So I raced over to the website. Marvelous. I was initially disappointed tho, that there was no thriving bar there, carrying on as if nothing had happened in 200 years. The KMSA FF's and their Femmes will tell you all that here, pubs and inns that have been serving ale and food for 200, 400, six hundred years in what appears the same bar , are common as ticks, but Hey its still serving dinner, and as i know in America, its simply a miricle that a commercial place that old is actually standing anyway, as most get "mysteriously" raised by fire or are just knocked down and built over. I was amused to read the title, 'The Fries Rebellion" and was thinking that this must have been the lunch time in 1972 when the Chip and buffalo wings maker in the kitchen didn't work, and the disgruntled crowd decamped angrily next door to the McDonalds and the Burger King lol... but i read that it was an actual chap named John Fries, way back when. Well that was a wonderful cut out and keep history lesson that will come with me, inside my rucsac the next time I fly. Sir Dayvd ( Do you want fries with that? ) of Oxfordshire.. I'll have to retell the story of "Lucy the Ghost" at The Falstaff Experience, Sheep Street, Stratford-Upon-Avon -- set in the "award-winning" 500 year-old half-timbered property. "It is simply the most unique and haunted building in the world according to Fiona Broome." Long story short, one evening The Wells and Kuhns took the popular spooky lantern-lit ghost tour. I remember thinking that this was the worst ghost tour I had ever been on, but kept my mouth shut until the end, when I just couldn't take it any longer. When we got up from benches to leave I mumbled how stupid this all was, then I heard something hit the floor. Looking down, I saw that my classes case had mysteriously popped out of my pocket (the only time it has ever happened). Get this, the glasses case was still closed, but the glasses were out of them. I reach down to pick them up just in time to see a very large man's foot step on them! 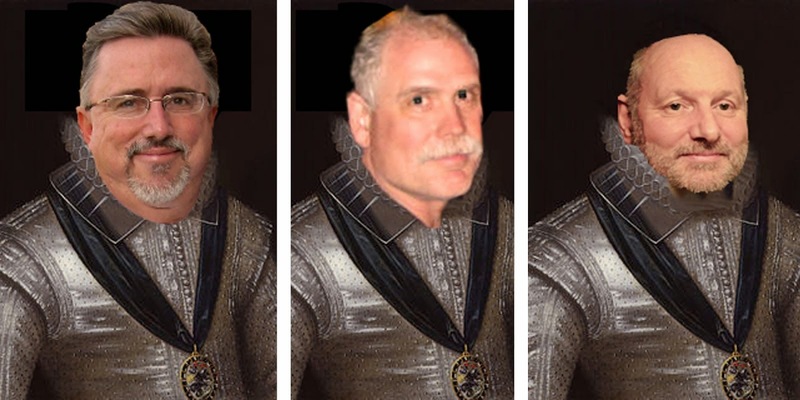 Sir Hook, thinking this was the funniest thing he heard, was recounting the story the following breakfast when he suddenly stopped laughing -- yes, Lady Lucy broke his tooth. Later that day, Lady Lucy stole the sunglasses from around my neck and hid them at a local pub until I finally admitted that the "ghost stories" we heard at The Falstaff were true -- I apologized to Lady Lucy. Later, at dinner, the glasses were mysteriously returned to me. I'm a believer! I have a $1,000 crown in my mouth as proof!